Add professional touches to your videos with easy and functional editing tools. Callnote records your entire display while simultaneously capturing your video camera, microphone, and your computer audio. When you’re done recording, the easy-to-use editing interface opens so you can start adjusting and revising your audio or video. Because nobody wants to hear your phone ringing or your dog barking in the background of your video. 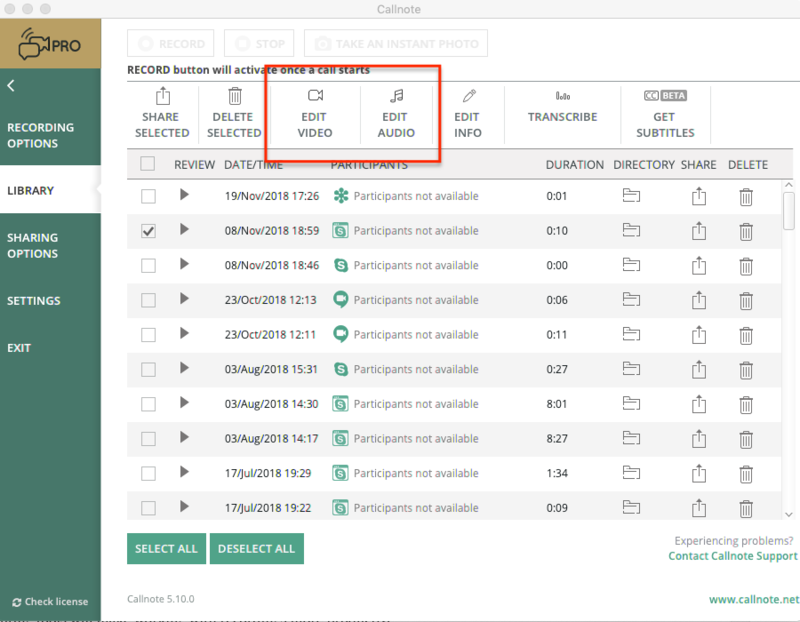 Open Callnote Library and select the recording you need to edit, then select EDIT AUDIO or EDIT VIDEO. Use a timeline to select the part of the recording you are going to trim and cut. Draw your audience’s eye to the most important aspects of your video by adding illustrative images. If your microphone picked up distracting background noises and echo from the room you can polish your recordings by adding pre-recorded audio track or music. Guide viewers through your clip with interesting and easy-to-follow instructions by adding standalone, overlay or inserted text. Save the edited video, it now takes a few seconds instead of minutes. Callnote Pro editing tools will make working with recordings more productive! Zoom In and Out on the timeline if you need to zoom in on an area of the timeline to make minor adjustments—or zoom out to see the big picture. Erase selection reduces the recording length and lets you easily trim and cut unnecessary parts of your video. Select the beginning and end of the clip you would like to erase. Click Play Selection to make sure. Click Erase Selection to drop it on the floor. The portion will be actually deleted when you click Save. Text clips are static images which display for the length of time you specify. Select the beginning and end with the scrollbar to add the text clip in your recording. Add music to set the mood of your video. Added audio file will overwrite the sound of the recording. Add intro/outro graphics to beginning/end of the video. Images are static and displayed for the length of time you specify by setting the duration. Download or upgrade to Callnote Pro to get improved Skype, Google Hangouts and Meet, Facebook, Facetime, Viber, GoToMeeting, Zoom and WebEx call recorder. Start today with a 14-days FREE trial!